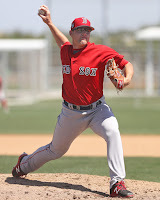 SoxProspects News: Minor Notes: Hit the gas or pump the brakes on Devers? Kevin Thomas of the Portland Press Herald got it right from the horse's mouth, however, with both Red Sox GM Dave Dombrowski and director of development Ben Crocket saying that Devers still needs more seasoning in the minors. Meanwhile, Chad Finn of Boston.com takes a closer look at Devers' stats and argues that Boston might not have a choice but to promote him, given the state of third base at the big league level. While not explicitly about Devers, Brian MacPherson of The Providence Journal looks at the current depth issues at third base for the Red Sox with the injury bug hitting the hot corner. In non-Devers news, Tim Britton of The Providence Journal writes about Brandon Workman's long road back to the majors. There's a reason nearly every publication in the Boston market was writing about Devers this week. After his ice cold start to 2016, Devers isn't missing many pitches at Double-A to start 2017. Perhaps most impressively for the young lefty is that Devers is using all fields with his power. In his two-homer game on May 2, Devers one-handed a shot over the Maine Monster in left and crushed another to right-center. Beyond the home runs, Devers is also cutting down on his strikeout rate and has impressed scouts with improved defense at the hot corner. If he continues to rake, this week's debate will surely continue to rage on whether or not to promote him. 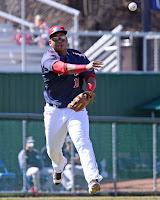 Shawaryn (pictured) set a Greenville Drive record for strikeouts in a game with his 12 K performance against Augusta on Saturday. The 2016 fifth-round pick has been dominating South Atlantic League hitters, where he currently sits second in that league in strikeouts with 44. If you throw out Shawaryn's dreadful season opener in which he surrendered nine runs, he has posted a sparkling 1.32 ERA in his last five starts and has lowered his opponents' batting average to .216. He has also shown excellent control all season, walking just eight in 29 1/3 innings pitched.